Disgusted with his native Japan’s turn toward Western society, the infamous war criminal Baron Katana built an army of robotic Samurai. He established his headquarters in his ancestral retreat, Black Heron Castle, situated on a tiny northern island of Japan. He also built a robotic swordmaster, Daisho. Equipping his Samuroids with jet packs, indestructible armor, and electrified swords, he prepared to take over Japan. Shortly before the planned attack, a discarded android was caught by a fisherman and sent to Interpol, where it came to the attention of Captain Hashi. Hashi’s friend, Barry Allen, was visiting Japan with his wife and had stopped by to visit. Another friend, filmmaker Toshira, recognized the insignia on the armor as that of the Black Heron. Barry went to check it out as the Flash, and was subsequently captured. Upon tracing the Heron to Baron Katana, Hashi led a strike force of Black Berets to the island, disguised as stunt men for one of Toshira’s samurai movies. (In fact, Barry’s friend had been trying for some months to identify the castle’s owner in order to obtain permission to film there.) In the ensuing battle, the Flash defeated the Samuroids by shorting out their control center and power source. 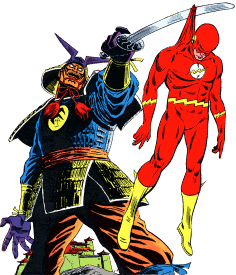 Baron Katana leaped from the castle walls into the ocean (Flash v.1 #180–181, 1968). Years later, the Penguin obtained a warehouse full of unused Samuroid units. He took them to scientist T.O. Morrow, who recognized them as his own handiwork (though he recalled designing them for a “warlord named Black Talon”). Morrow upgraded them with new bacteria-based artificial intelligence, and the Penguin sent them to assassinate a business rival: Bruce Wayne. Flash Jay Garrick found a way to neutralize the AI systems (Brave and the Bold #13, 2008). 1. In the original story, it is implied that Baron Katana was responsible for Japan’s actions in World War II. A more modern interpretation would presumably set his past activities in another country and another war. 2. None of the Japanese characters in the story use more than one name. Aside from Captain Hashi, it’s not clear which are family names and which are given names. 3. This discrepancy could be simple misremembering on Morrow’s part, or a deliberate retcon, or a misremembering on the part of the writer. Whatever the case, it’s only the name of a one-off villain from 40 years ago. In Flash #180, Toshira refers to Barry as the “U.C.L.A. Flash,” a nickname he apparently picked up playing for “the home team.” Which sport is never identified.